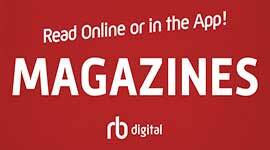 RBdigital (formerly called Zinio) is the world’s largest newsstand, offering full color, interactive digital magazines for your enjoyment. Browse the library’s collection of popular titles with no holds, no checkout periods, and no limit to the number of magazines you can download. Downloadable audiobooks have been added to RBdigital. (In fact, “RB” stands for Recorded Books.) Audiobooks may be checked out for up to ten days.